With growing interest in playing host to a variety of sports, it’s no wonder Grand Park plans to continue growing its offerings. In Westfield, Indiana, 26 diamonds and 31 multi-purpose fields, 3 indoor fields and 8 indoor courts are scattered across 400 acres at the largest sports complex of its kind: Grand Park. Whether you’re planning a youth baseball game or a national soccer championship, your teams (and fans) will be treated to top-quality amenities that can only be found at a complex of this magnitude. Grand Park’s impressive lineup of playing space and amenities makes it an ideal tournament and event host. In 2017, Grand Park will host a variety of events on both sides of the complex. On the field sports side:Indiana Soccer State Cup; US Club Soccer Nationals; NXT Sports’ “The Grail” Lacrosse tournament; and USA Archery Outdoor National Championships. 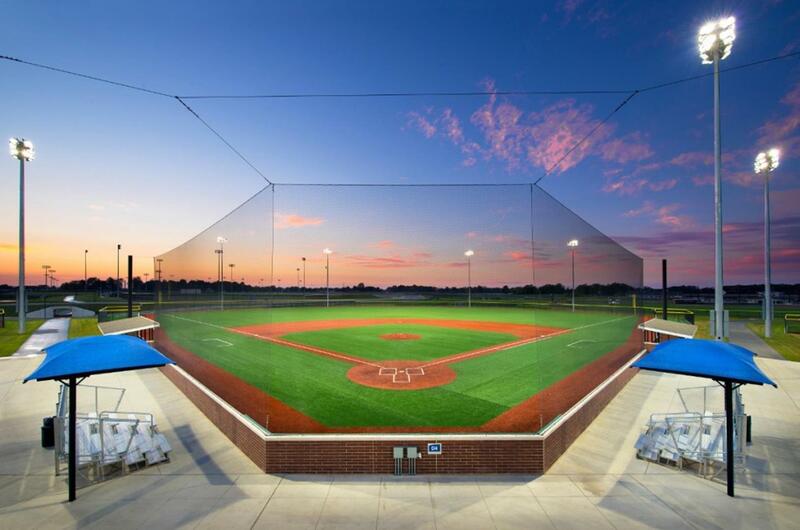 On the diamond side: Amateur Baseball Championships; Perfect Game Super25 Midwest Qualifier; 4th Annual Softball Game Day; and Grand Park Frenzy. The fact that Hamilton County has so much to offer teams coming in from out of town has been a great selling point to coaches. From the moment we pulled up, I knew Grand Park was going to be different. We had seen pictures and videos of Grand Park before but they certainly do not do this place justice. From the total amount of fields, plentiful parking and beautiful permanent facilities, Grand Park truly is an event director’s dream. Grand Park is one of the most impressive baseball venues I have been to in the country. The design of the park makes it easy to run multiple baseball tournaments of all age groups. The staff at Grand Park was very helpful and willing to help out with whatever I needed throughout the tournament. I highly recommend attending a baseball tournament at this facility; you will be impressed. Grand Park has been a consistent host for many U.S. Soccer Development Academy regional events as well as our National Playoffs and Summer Showcase. The development of the facility is another positive step for the growth of the game. Grand Park provides our players and coaches with the opportunity to perform in a premier environment that is ideal for world-class player development. In terms of running large-scale baseball events, Grand Park is without peer. I have been running events for 12 years, and Grand Park is clearly the most impressive in scope and design. We have run the Prep Baseball Report Future Games at Grand Park for the last two years, and again this coming summer. At the high school level, the Future Games is one of the most heavily scouted events in the country, and the design of the clover-field set up, with a scout tower in the middle, is perfect to host 250 college coaches. On the youth side, last year we had nearly 800 players and there was still plenty of room to spare. Aside from the conducive setup, the fields are always well maintained, the park is clean and the staff extremely helpful. The bottom line is Grand Park is the premier venue for hosting baseball events that I have experienced in the country. are synthetic. Five of these eight diamonds offer lights (four synthetic and one grass). D1’s dimensions are: 330 feet down the lines and 400 feet to center. D2-D8’s dimensions are: 320 feet down the lines and 390 feet to center. In addition to these eight diamonds, Grand Park offers four grass Flex Diamonds for 13U-14U level of play. D9, D10 and D12 dimensions are: 275 feet down the lines and 350 feet to center. D11 dimensions are: 300 feet to left, 290 feet to center and 235 feet to right. There are six softball diamonds with skinned infields. Portable mounds can be used for 12U and below (grass). D21-D26’s dimensions are: 200 feet down the lines and 215 feet to center. 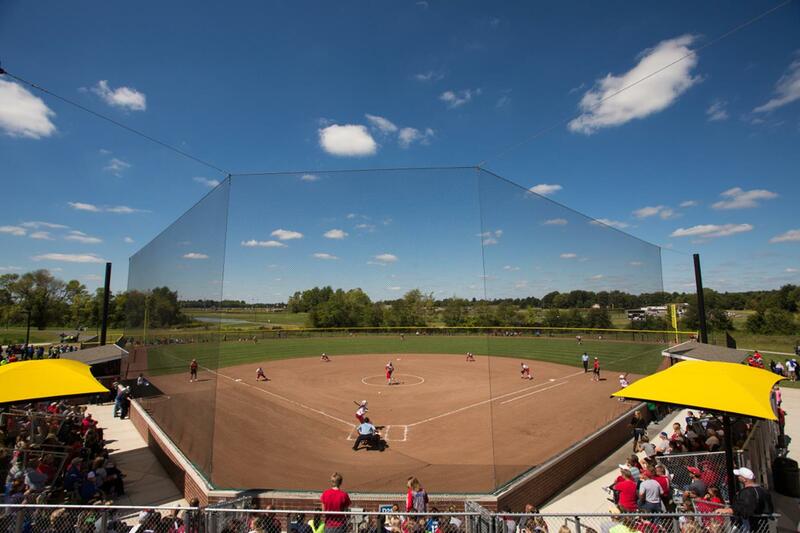 Out of the eight junior diamonds at Grand Park, four are grass and four are lighted synthetic diamonds. D13-D20 dimensions are: 215 feet down the lines and 245 feet to center. Grand Park features 31 multi-purpose fields – seven synthetic and 24 engineered Kentucky bluegrass. All seven synthetic fields and one championship grass field (F1) have lights. The playing surface dimensions for all fields are: 360 feet by 270 feet. Nine parking lots with 3,117 asphalt parking spaces are spread throughout Grand Park, designed in a way that visitors are never farther than a two-field walk from their lots. Additionally, there are roughly 1,100 grass/gravel parking spaces. Players, coaches, referees and fans enjoy seven concession stands. Each stand is equipped with a second level that offers a 360-degree view of the complex and is used for meetings, bookkeeping and scouting. For seating, each diamond has two sets of permanent stands with a capacity of 30 per stand. An administration building is located on each side of the facility and offers space for officials, teams, classrooms, etc. Both buildings are identical in design with one large conference room that can be broken into two smaller breakout rooms, and one small conference room. There are restrooms and locker-room facilities in both of the buildings as well. Some events have used the garage bays to set up a referee headquarters. The administration building use is optional with the coming indoor facility available to support event activation of all sizes. Grand Park recently added an 88,000-square-foot basketball facility, officially opened in January 2016. Jonathan Byrd’s Fieldhouse features eight full-size basketball courts, including one NBA regulation-size. There are three HD cameras on every court with 12 Wi-Fi hotspots throughout the facility. A mezzanine level is available for viewing and a full-service restaurant is provided by Jonathan Byrd’s catering. Additional amenities include four shoot-a-way machines and sponsorship opportunities on every court. The fieldhouse is currently home to Indianapolis Diesels semi-pro basketball team, Indy Juniors Volleyball Club and George Hill Rising Stars, Inc. In 2016, Jonathan Byrd’s Fieldhouse will host the prestigious Nike EYBL Tournament; AAU Super Regional; USJN – Hoops in the Heartland Tournament; USJN – Indy 100 Tournament; Adidas Mother’s Day Tip Off; George Hill Rising Stars Invitational; Rick Mount Shooting Day Camps; and multiple USSSA Basketball events. Construction is underway for an additional indoor facility, expected to be complete in July 2016. This 335,000-square-foot facility will house three full-size professional fields (115 by 75 yards each); a 45,000-square-foot warm-up area; a 30,000 square-foot mezzanine concourse for spectator viewing; 5,000 square feet of meeting space; and food and beverage services. In 2016, a 1,500-seat field sports stadium will be built around the championship field (F1) and will be expandable for larger events. It will feature playgrounds and a variety of configuration options for all levels of play. Grand Park Village is currently in the design stage, but will serve as an adjacent 220-acre development for lodging, lakeside dining, retail and entertainment – all along a pedestrian-friendly boardwalk. Grand Park is less than an hour’s drive from Indianapolis Airport and about a half hour from the city of Indianapolis. The sports complex is easily accessible via many highways, including US-31 and I-465 East and West.